Organized by Design’s Real Estate Home Staging and Curb Appeal Consultation is your guide to a professionally prepared, staged and photo-ready property to excel in a competitive real estate market. Organized by Design’s Real Estate Home Staging and Curb Appeal Consultation and Property Assessment™ was originally created by myself, Sherry Castaldi, as a step-by-step approach to assist home sellers in how to prepare their home for the market. When assessing the home for sale, I will explain the basis behind my recommendations and why my suggestions will benefit the seller by reducing negative buyer feedback. As an additional resource after the on-site Consultation, I provide the seller with my typed Property Assessment that details the information obtained from the Consultation allowing the seller to use it as a D-I-Y checklist to prepare their property for the real estate market. This phenomenal service is an invaluable asset to both the seller and their Realtor in marketing the home to sell to the potential buyers. By following Organized by Design’s Real Estate Home Staging and Curb Appeal Consultation expert advice, the following properties achieved Sold Over List Price Success! is a value beyond comparison! Expert Remote Consultation Service is a solution for when you need help with a Professional Photo Styling or Distance Staging dilemma and an on-site visit from Organized by Design isn’t attainable. This is typically for one “need to know what to do” question. At times, it may be a few questions or a one room dilemma you would like us to address for you. This is not to be perceived as a one-second response but a way to assist those that desire our expertise when an in-house visit is not possible. Send photo(s) electronically with your questions. The better your photo(s), the better visual reference we have to advise you. There may be times upon seeing the photos, we’ll be able to give our recommendations immediately and other times we may want to give careful thought and consideration before making a recommendation. Please allow 48 hours from our receipt of your photo(s) for us to analyze the photos and your concern before giving guidance with our response. since questions, photos and response are done electronically, service must be scheduled and paid in advance prior to sending photos and receiving response. 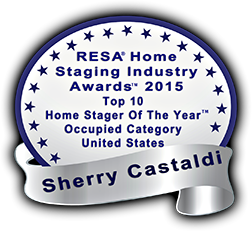 See What Home Staging Consultation Clients are Saying.